The existing perception that ice-cream contains too many calories is just a myth! In contrast, scientists have proven lately that ice-cream is very beneficial to the human body, since it contains many nutritious substances. 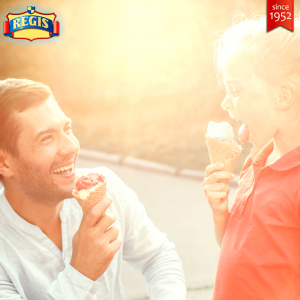 The primary ingredient of ice cream is milk, therefore, ice-cream is considered as nutritious as yogurt and cheese. Scientists have also come to the conclusion that ice-cream contains properties that fight anxiety and is a perfect pleasure, especially during hot weather, that nobody can resist. Milk, that is the main ingredient of ice cream, consists of water, fat which contains various fatty acids and vitamins A, D, E and K, lactose, proteins, enzymes and minerals. 19 vitamins are found in milk and the main minerals are calcium, magnesium, phosphorous, sodium and potassium. Ice cream is considered among the richest sources of calcium, phosphorous and other minerals in nutrition. The nutritional value and digestible properties of ice cream are well recognized by medical scientists. Ice cream is an essential part of menus in hospitals all over the world. Please see below a table with the average nutritional value for each ice cream.